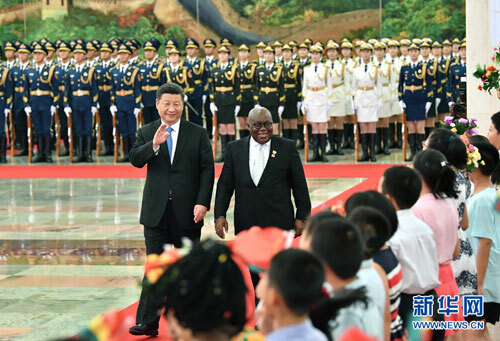 BEIJING, Sept. 1,Chinese President Xi Jinping on Saturday held talks with Ghana's President Nana Akufo-Addo, and the two leaders agreed to inject new vitality into and further enrich the bilateral relations. Akufo-Addo is on a state visit to China. He is also to attend the 2018 Beijing Summit of the Forum on China-Africa Cooperation scheduled for Sept. 3 and 4. Noting the long tradition of China-Ghana friendship, Xi said China has always seen Ghana as a reliable friend and a good partner of common development. The bilateral ties had played a leading role in the development of China-Africa relations. The two sides should inject new vitality into and further enrich their relations, make high-level visits more frequent and continue their mutual understanding and support, Xi said. Ghana is welcome to participate in the Belt and Road construction and join the Asian Infrastructure Investment Bank. China is ready to forge synergy of the two countries' development strategies, widen cooperation in various fields, and strengthen people-to-people and cultural exchanges, Xi said. The two sides should enhance communication and coordination on international and regional affairs to better safeguard the common interests of the two countries and the developing countries, Xi said. For his part, Akufo-Addo said the Ghana-China friendship forged by the two countries' older generations of leaders is unbreakable. Ghana cast its vote in support of the People's Republic of China regaining its rightful seat in the United Nations and has been upholding the one-China policy. Akufo-Addo said Ghana is willing to deepen bilateral relations, actively participate in the Belt and Road construction and inject new vitality into the bilateral cooperation. Marching on the road of socialism with Chinese characteristics, China plays an important role in world peace and development. China provides an important opportunity for Africa's stability and revitalization, he said. Ghana will always be China's trustworthy friend in Africa, Akufo-Addo said. After the talks, the two presidents witnessed the signing of cooperation documents.